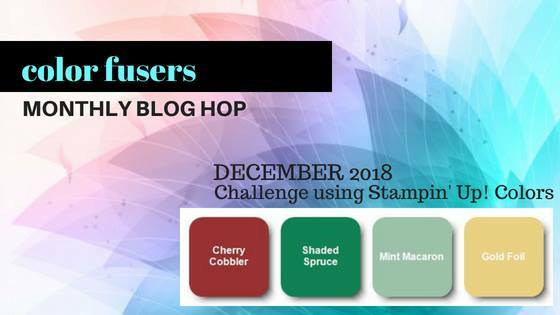 Welcome to the December Color Challenge for the Color Fusers Blog Hop! The color challenge this month seems so fitting for a Christmas card but to be honest, at this time of year I’ve created so many holiday-themed cards that I’m ready to move on to something else. 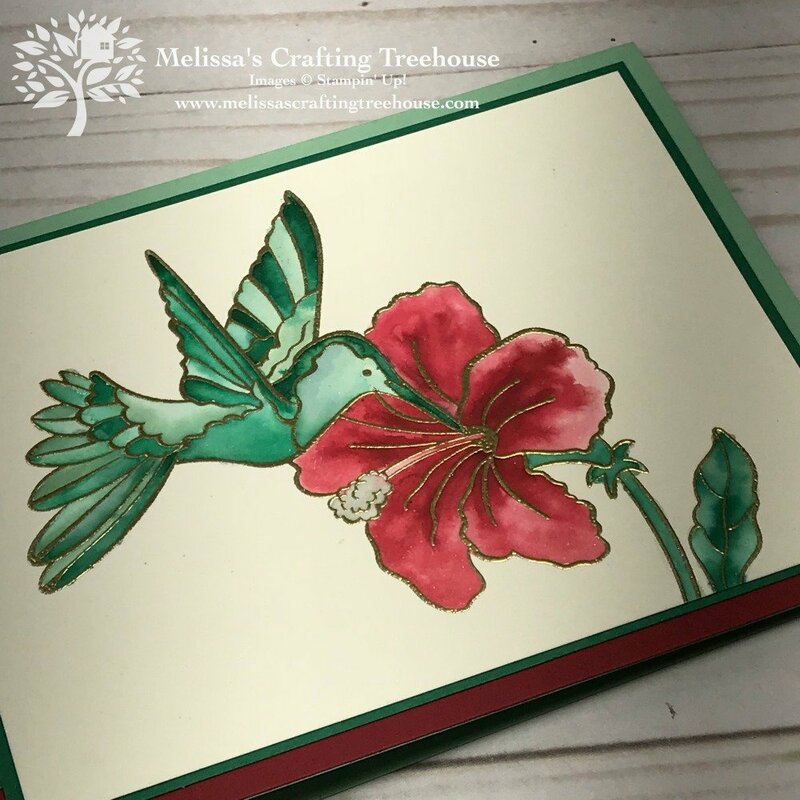 Well, reds and greens aren’t just for Christmas and I love it with my hummingbird and flower! Today’s color challenge project features a sneak peek of a set that will be in the Occasions Catalog and available to purchase starting 1/3/18. The name of the stamp set is Humming Along and I am already in love with it. This was one of the stamp sets that Stampin’ Up! gave to all 6000 plus attendees, that went to OnStage Live in Orlando last month. Amazing right? 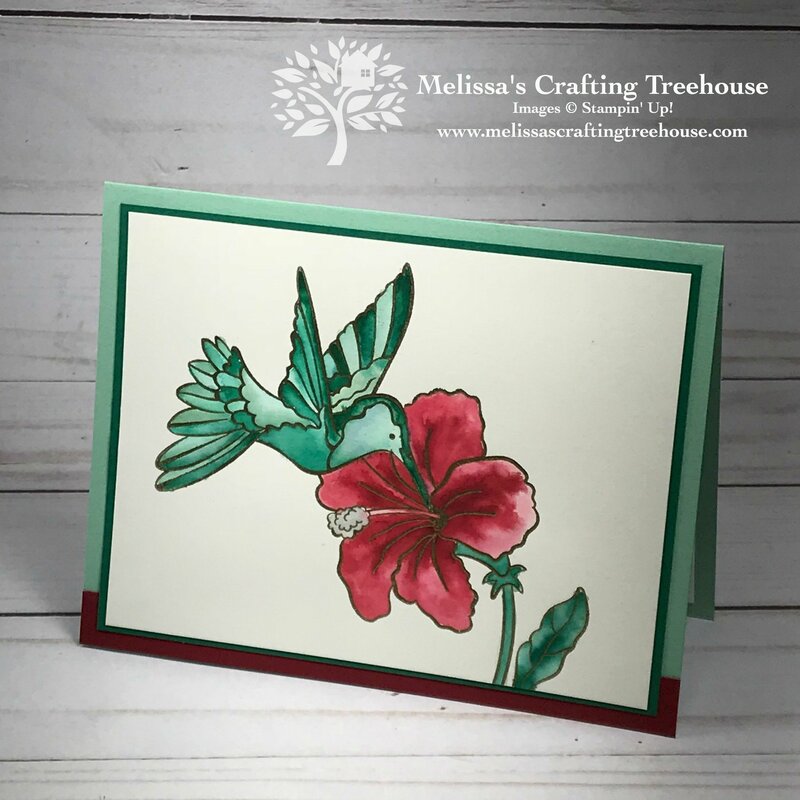 For this card, I’ve used a technique called Masking to make it look like the flower is in behind the bird. Masking seems a little like magic but it’s in fact, really simple. 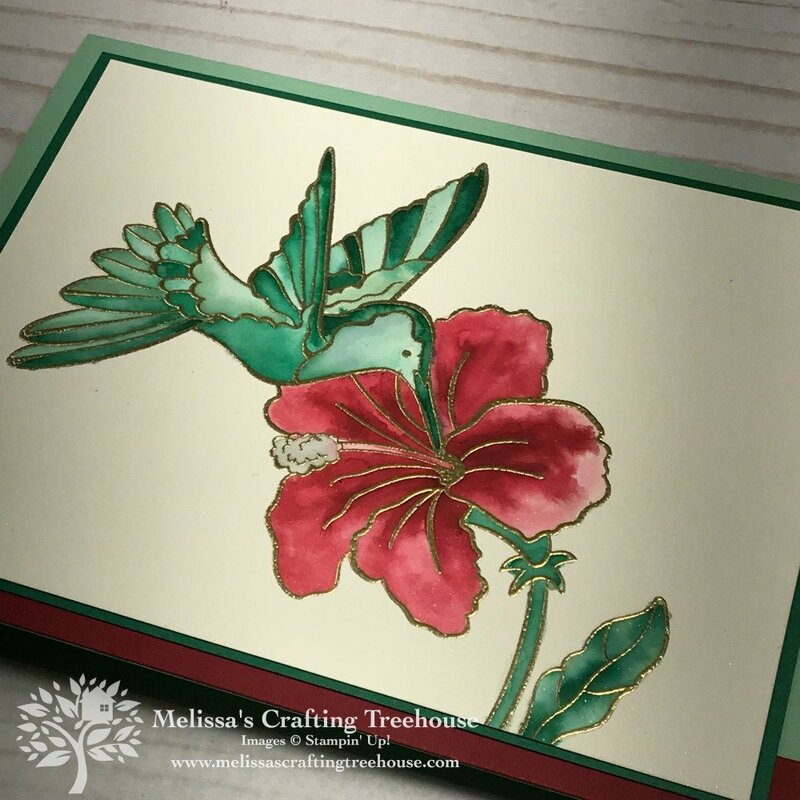 Start by stamping the hummingbird onto a post-it note or onto some art masking tape. Then, cut out the hummingbird. Next, stamp the hummingbird image onto your focal piece, so that the bird’s beak is not quite perfectly vertical. I’d estimate it’s at about an 80-degree angle. 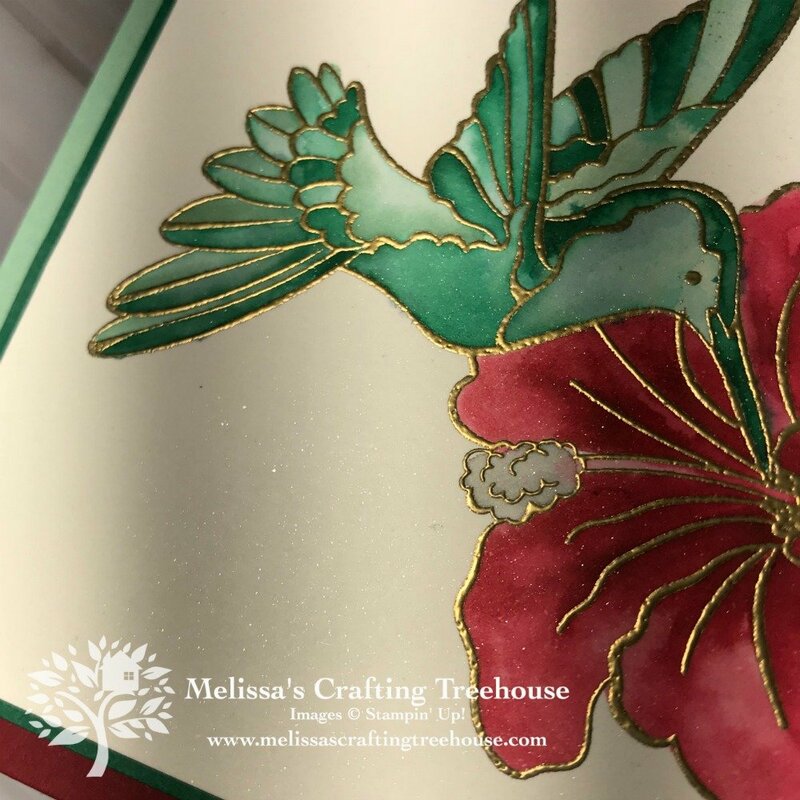 For my bird, I used Versamark and Gold embossing powder. Place the bird mask over the bird that is stamped on your focal piece. Then stamp the flower image over the bird, such that the bird will look like it’s drinking the nectar from the flower. The flower is also heat embossed with gold embossing powder. I then used an Aqua Painter to watercolor my images. In this next photo, you may be able to see that there’s a little shimmer to my cardstock. The Shimmery White Cardstock is great for water coloring, plus it’s got the added bonus of having that shimmery finish. So I wasn’t kidding when I said I love this Humming along set. In fact, I’ve already created SEVEN projects with this set! I’ll be sharing a few more of these in my upcoming facebook live this week! 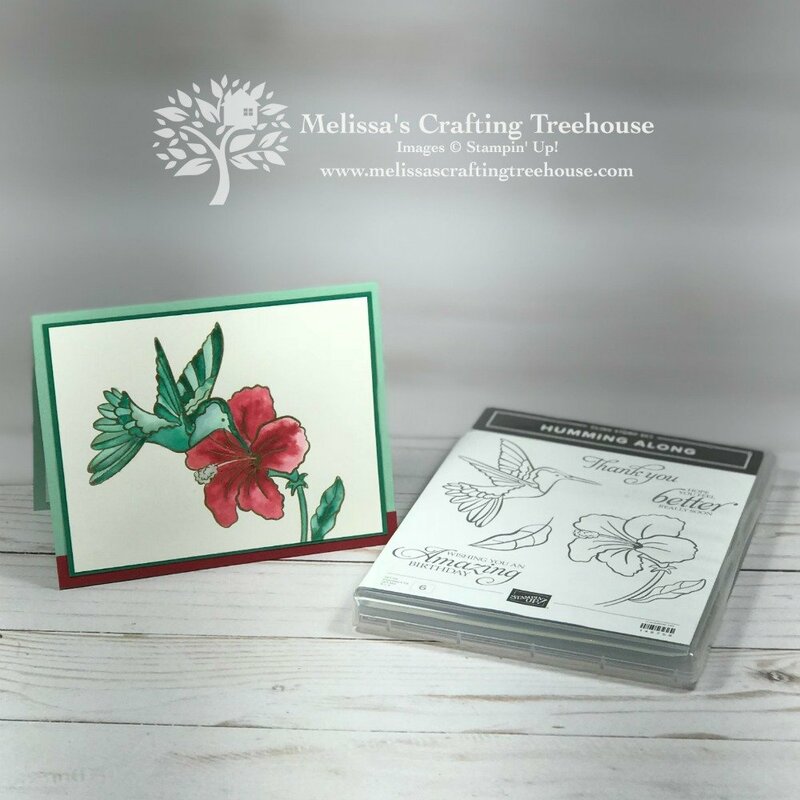 To see these projects, find me LIVE at Melissa’s Crafting Treehouse Facebook Page, on Thursday 12/6 at 4 pm EST or check out the replay afterward. I hope you enjoyed my project today and will leave a comment and tell me what you think! For your convenience, you’ll find a complete supply list and project dimensions just ahead. 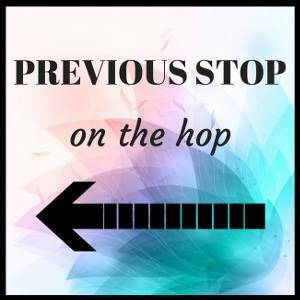 Be sure to continue along on the blog hop today! 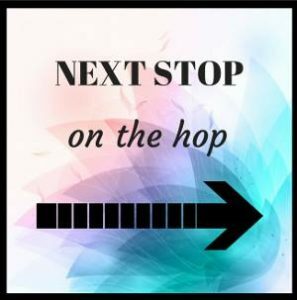 The next stop is Bonnie O’Neill‘s Blog. I know you’ll enjoy what she’s got to share! Click HERE to see my PopUp Slider Card that uses Masking with the Animal Outing Stamp Set. Use the current hostess code to get Free Card Kits, and other perks with your qualifying purchases! Wow! That gold really makes it pop! TFS! Thanks Melanie. I’m glad you like the project. I agree that the gold embossing really adds a lot.